An unused talent will cause you to lose your passion for life and your passion for God. 1 Peter 4:10 says “Each of you has been blessed with one of God’s many wonderful gifts to be used in the service of others. So use your gifts well.” Notice God gives you certain talents, abilities, personality, gifts — the shape that He’s given you — and those gifts, those talents that you’ve been given are not for your benefit. They’re for the benefit of other people. My gifts are for your benefit. Your gifts are for my benefit. You are to use those gifts in the service of other people. God has given you a special role in this world. He wants you to make a contribution with your life. God says, I have given you these gifts and talents. If you don’t use your talents you’re going to lose your passion. God did not give you special abilities just to sit on them and do nothing with them. God says I want you to use it or you’re going to lose it. 1 Corinthians 7 “Each one should live his life with the gifts that the Lord has given him.” God gave you gifts and abilities and talents to use. This is a big one. Few things rob us of joy, rob your confidence, rob your passion, more quickly than guilt. Here’s how it works with guilt, the sin in our lives. We don’t walk around thinking, “I have a sin in my life. I am a guilty person.” No, we rationalize it consciously. Consciously we think, “It’s ok. Everybody’s doing it. It’s no big deal.” But subconsciously it gnaws at us. Subconsciously whenever it gets quiet that guilt pops into your mind. Conflict just drains the passion right out of you. Do you ever start a day and it’s going to be a great day — you know it. You just fly out of bed. You’re awake from the moment you get up. You’re ready for the day — shower, breakfast — you’re ready. You’re on the way out the door and you have a fight with your husband or your wife. All the zip goes out of your doo-dah. It’s like the air going out of a tire when the conflict comes. That’s what conflict does to us. It takes all the passion out of our lives. Your attitude all of a sudden just goes flat. These next verses talk about them. Job 5:2 “Resentment destroys the fool and jealousy kills the simple.” Passion killing emotions. Job 18:4 “You are only hurting yourself with your anger.” Anger only hurts you. Sometimes you lose passion for God because you’re not spending time around other people who have a passion for God. You’re not spending time around other Christians. You’re not getting any fellowship. I love this incredibly practical verse in Ecclesiastes 4:9-10, just common sense from the Bible. “Two are better than one… because if one falls down his friend can help him up. But pity the man who falls and has no one to help him up!” We need each other. We all fall sometimes. We all stumble at times. So we all need people to help us up in our lives. Other Christians help keep our passion for Jesus stirred up. When you forget the purpose of your life – the call of God on your life – that is a sure way to kill your passion for life and for God. If you don’t know the purpose for life, why bother? Why get up in the morning? Why put forth the effort? Why get out of bed? Life without purpose is activity without direction. It’s motion without meaning. Life without purpose is trivial, petty, and pointless. Nothing matters more than knowing and living the purpose, the reason, that God put you on earth to fulfill. Nothing else can compensate for not living out that call and purpose. Not fame, not wealth, not success, not pleasure. Nothing can compensate for life without meaning. So whenever your purpose gets unclear and you tend to forget why we’re here in the first place you’re going to lose your passion. 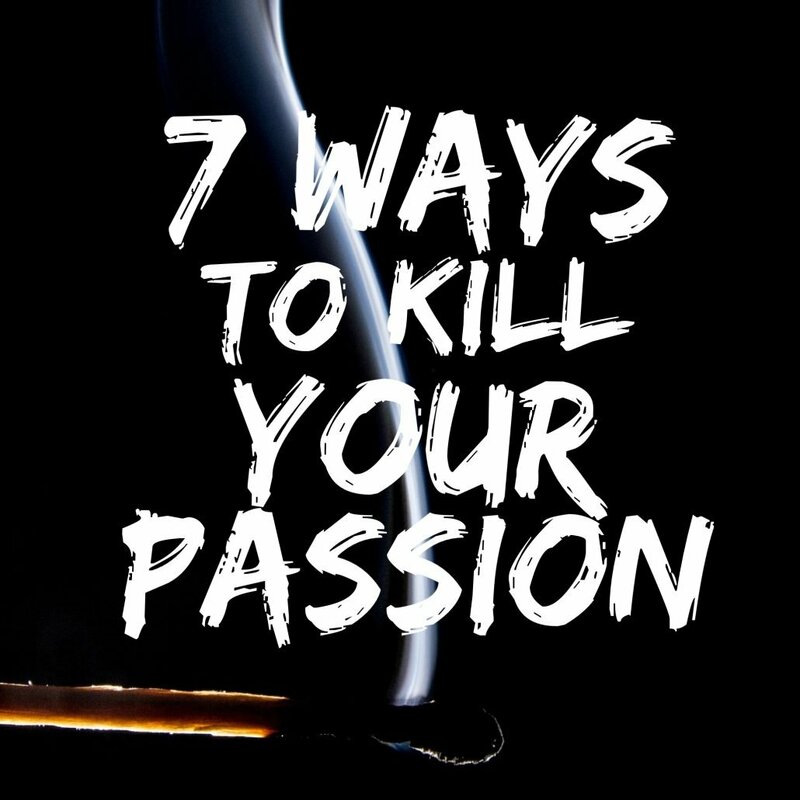 An unclear purpose will kill your passion. Every day you face all kinds of circumstances that conspire to shrink your spirit and shrivel your heart. You’re going to get up tomorrow morning. You’re going to have distractions and disappointments. You’re going to have conflicts and you’re going to have changes and challenges. You’re going to have problems and pressures. You’re going to have frustrations and fears and failures and fatigue. All of these things fall in on you to shrivel your heart and shrink your spirit. So you must intentionally nourish your spirit. If you don’t do it nobody else is going to do it for you. Nobody else is going to nourish your spirit. So if you don’t take the time and trouble to do it, it’s going to shrivel up.